I finished my first ever commissioned hand lettered piece for Melania over at Warlordme. She is the owner of a fashion company that offers: "inspiration through unique, affordable clothing and accessories for the woman with a need to seamlessly transition from professional to playful." I was so excited to work on this promotional card, because it gave me a chance to work with Melania again. I was able to create a logo for her company in July of 2016. Melania returned to me after seeing a few of my hand lettered posts on Instagram. She knew that she wanted to create a promotional card that she could use at various networking events. Her goal was to have a black and white design; she would then use pink envelopes as her accent color. She also knew that it would be kept one-sided. Keeping the back empty would allow her to write handwritten notes to her customers, to add a personalized touch. What makes her awesome is that she has a strong vision and knows what she wants. Keep in mind, this could be a dangerous combo if she had bad taste; but as the owner of a fashion forward company, I didn’t have to worry about that. To celebrate her new promotion card she is giving YOU 25% off your next purchase! 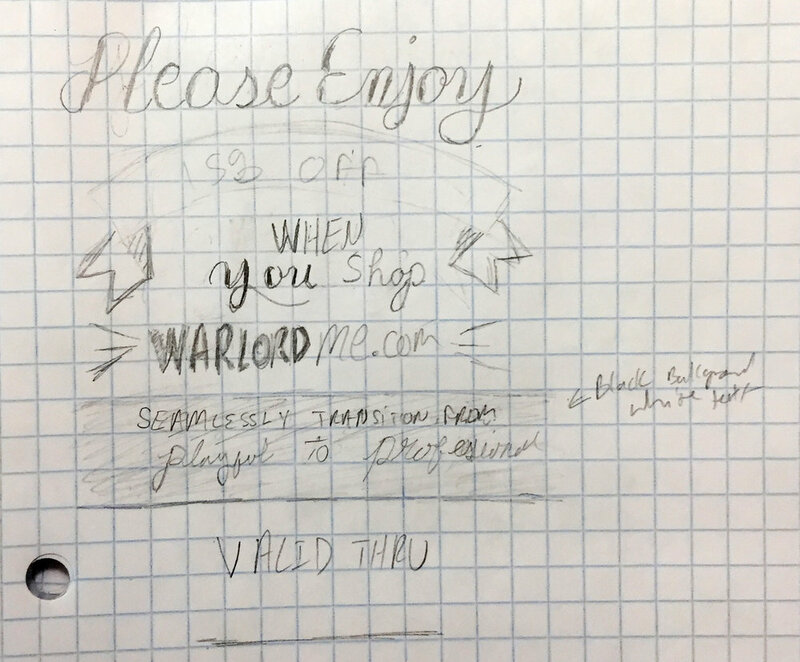 Just go to Warlordme.com in the month of September, pick out some goodies and type in code ispii25 . I told you she was awesome! The following case study is an outline of my work in creating the promotional card. You will be able to follow along with my design process and see how I went from point A to point B. For easier collaboration, I added her as a co-creator to the Pinterest board. It helped to further establish the art direction for the promotional card. We explored Blackletter images that show a strong masculine side, but also had images with script font, fun borders, and shading. Because of this, I decided to start out with a few sketches that would have contrasting themes. I wanted the card to be both feminine and masculine, serious and fun. The tagline for Melania’s company is “Seamlessly Transition From Professional to Playful," so it was important for the card to have a fun, but professional spirit. To help convey this, I drew one sans serif font that was very strong and masculine; the other was a script font that was much more whimsical. I wanted Melania to have the option to use these cards on multiple occasions. So at the top, under "Please Enjoy," we left a line for the coupon code. We also left a couple of lines at the bottom for the date. I showed Melania three rough sketches, and from there we narrowed in on a few elements from each. We decided on the sans serif font from the third sketch for "Please Enjoy." We then took the border from the first sketch, as well as the script font for "Professional to Playful." From there, I drew a combination of her favorite elements in Photoshop using the Apple Pencil and iPad Pro, via Astropad. You can see on the right a more refined version that brought us one step closer to the final image. For the final image, I further refined the promotion card in photoshop; adjusting the space in between the letters and adding a few more embellishments along the lines and in the corners of the graphic.